Adobe Acrobat Reader has not been my choice of free PDF reader utility thanks to it's security issues, bloat and intrusive updater. Adobe has now started to address these issues and the latest release of "Adobe Acrobat Reader X" features new security measure known as “Adobe Reader Protected Mode” which is a sandboxing functionality which basically isolates the PDF reader from rest of the system shielding the user computer from any threat embedded into the document, the technology is based on Microsoft’s “Practical Windows Sandboxing”. View and interact with PDF files that contain an even wider variety of content types, including drawings, email messages, spreadsheets, videos, and other multimedia elements. Choose reading mode to fit more content on the screen or two-up mode to view page spreads. Use keyboard shortcuts like print, zoom, and find within the browser. Take advantage of the added security of Protected Mode in Reader, which helps ensure safer viewing of PDF files. 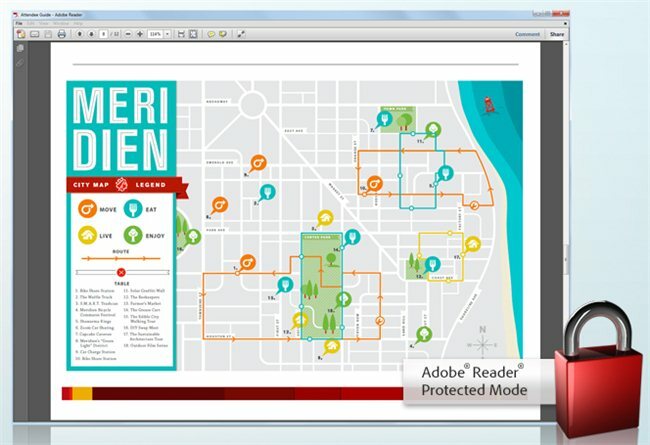 Directly access online services at Acrobat.com from within Reader X. Perform common tasks such as creating PDF files, securely sharing and storing documents, and screen-sharing.